Asserting the Latino Legacy: 6 easy things we can and must do"
Pacific's Latinx Heritage Month celebration invites you to a lecture by Dr. Maggie Rivas-Rodriguez. The event begins with a reception at 5 p.m. and lecture at 6 p.m.
Rivas-Rodriguez is an author and professor of journalism at the University of Texas at Austin, as well as the founder and director of the multi-faceted Voces Oral History Project, formerly known as the U.S. Latino & Latina WWII Oral History Project. Rivas-Rodriguez’ work related to Voces has been recognized nationally by the National Council of La Raza; the National Association of Latino Independent Producers (NALIP); the National Association of Hispanic Journalists (NAHJ); the National Association for Chicana and Chicano Studies (NACCS). 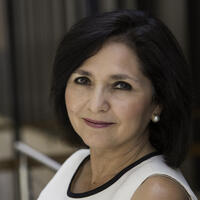 Rivas-Rodriguez worked as a journalist for more than 17 years in major market news outlets, including The Boston Globe, United Press International, WFAA-TV in Dallas and The Dallas Morning News. She was on the organizing committee that created the National Association of Hispanic Journalists and served on its board. Since its inception in 1999, the project has recorded interviews across the country with over 1,000 Latinos/as of the WWII, Korean War and Vietnam War generations. In 2013, it added a new collection on Latino Political and Civic Engagement. The project excels in three areas: research, teaching and community service. In 2017, it launched the US Latina & Latino Oral History Journal (published by the University of Texas Press and sponsored by the UT Center for Mexican American Studies). It has produced five books. It holds an annual summer institute for researchers who wish to use oral history in their research and teaching, and most recently developed a one-day workshop for middle and high school teachers who wish to use oral history in their classrooms. Thank you Pacific Arts and Lectures for their sponsorship to make this happen. We greatly appreciate it.